Climate change is a reality, a crisis facing us all, yet in this period of turmoil - geo-politically via Trump, Brexit, and the rise of the far right, and environmentally with rising temperatures and extreme weather - there remains cause for hope. For Uachtarán na hÉireann, Michael D Higgins, that hope lies in the commitment and energy of young people; the determination and questioning they will bring to bear on politics; and how their questioning and activism will re-shape it to meet the challenges of the coming years. 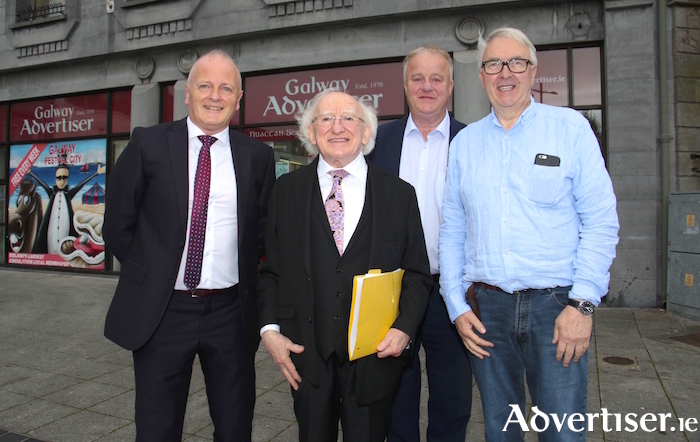 Uachtarán Higgins was in Galway this week, as part of his campaign for a second term as president. The man is no stranger to elections, first running for the Dáil in the 1969 general election as the Labour Party candidate. In the 49 years since, he served as a city and county councillor, mayor of Galway, senator, TD, and cabinet minister, before being elected Uachtarán na hÉireann in 2011. Despite initially saying he would only serve one term, he announced earlier this year he would seek re-election, and with the polls showing a commanding lead over his opponents, the man many refer to simply as ‘Michael D’ looks set to return to Áras an Uachtaráin after October 26. So what lies behind the energy that continues to drive a career in politics and public life that is fast approaching the half-century mark? “More than anything it has been the experience of my early life,” he declares. “I came to Galway in January 1961. I was a clerk in the ESB, I was 19, and from my year in school, very few people went to third level. I remember the argument here in Galway was, could we have night classes to enable those who had a very good Leaving Cert to actuality get a qualification? Eventually someone lent me the £200 and I went to university, and worked in England every summer. What that gave me was a deep conviction that this right to education should be available to everyone. Speaking at an election campaign event in the Town Hall Theatre on Monday night, Uachtarán Higgins said the next seven years in Ireland would be “both challenging and transformative”. In that light, what are the key themes and ideas, he will need to address, if re-elected as president? Above all of this, though, hovers the reality of climate change, the impact it will have on society and daily life, economics, and politics. A key idea throughout his career has been ‘Never accept as inevitable those things which are presented to you as inevitable. There is always a third way.' Neither the climate denial of Trump and the far-Right, nor the tinkering around the edges of the issue by the declining neo-liberalist centrist order, can meet the scale of what is confronting the planet, what Uachtarán Higgins has called, “one of the great, great challenges of our times”. However, in this crises he sees hope - he is forever an optimist - and argues that climate change will not only force, eventually, new approaches to environmental issues, but fundamentally change politics, leading to the creation of new political outlooks and systems. “A new economic literacy is necessary for people to understand what are presented as ‘fiscal choices’ and ‘living choices’,” he says, “but I’ve no doubt whatsoever about where the debate is going. It is going on a new connection between economy, ecology, society, and culture. That is where the fresh thinking is, and with recent reports on climate change from the expert body of the United Nations, telling us we are in the preliminary stage of what is little less than a crisis, we don’t have a choice anymore. It’s not just an option. “I always used to question the ‘inevitabilities’ because to say there is a single version of anything is so limiting. I would say two things are gone. You can see the ravages of extreme market theory being questioned. Also, a centralised state system damaged the case for some of the social democratic and socialist theories, so you are going to see a new form of ‘peopled economics’, but if it is to catch with young people, it will have to have a strong ecological theme. Another key factor in Uachtarán Higgins’ optimism, is his belief in the potential, abilities, and commitment of the young generation in Ireland - as witnessed by the activism and engagement that has led to marriage equality, the repeal of the Eighth Amendment, and the questioning the failed ’market will provide’ approach that is sustaining the State’s housing crisis.